Whether you are a business owner or just a regular Joe or Jen, when it comes to business dealings, you owe it to yourself to put them all in writing. Oral contracts (many people use the term “verbal” when they mean “oral,” but the term “verbal” includes anything that uses words) are enforceable in court in most instances (real estate transactions are a notable exception), but they are notoriously difficult to prove, often coming down to a “he said, she said” type of situation. Most people choose not to put things in writing, either because it seems like too much trouble, or because they “trust” the other person. Both of these reasons are quite foolish. Many disputes are not the result of bad intent on either side, but rather are due to an honest difference of opinion as to the terms of the agreement. Having the terms spelled out clearly in writing will usually clear up these misunderstandings. Further, we should keep in mind that “trusting” people in business dealings, even close family members, can prove to be an unwise decision, since people will usually act in self interest when it comes to business. Make two originals, one for each party, both signed and dated by all parties. If there is a dispute, you should both be able to produce an original. Sign the agreement in blue ink. This makes it easy to see that you have an original and not a copy (although it’s not that difficult nowadays to make a color copy!). Write in plain English. Don’t try to make it fancy by trying to speak in lawyer-like language. “The party of the first part” and such legal-speak should be left out. Don’t amend a written agreement orally. It will not hold up in court. A written agreement can only be amended in writing. When money changes hands, always use written receipts or pay in a form that can be proven, such as check, money order or credit card. Paying in cash, with no receipt to prove payment, is the height of folly and can come back to haunt you if the other party disputes your payment. 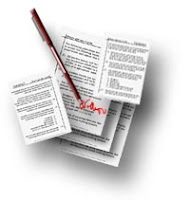 Always, always, always read contracts carefully before signing!